Team Colibri: Totalscan- HDI - LSS - 3D - What? Totalscan- HDI - LSS - 3D - What? After the introduction of Simrad and Lowrance take on the "all in one"-transducer, TotalScan, we have recived several questions on what our preferred setup would be when it comes to scanning sonar. Here I will try to answer these questions. We will look at the technical differences, and how that transforms to practical differences out on the water. Let us start with the tech, What are these ducers? 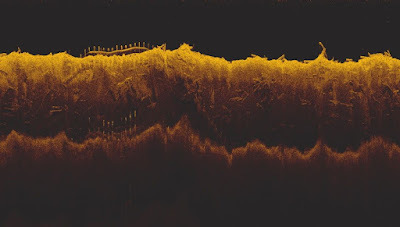 They are all ducers for scanning sonar, ie they use high frequenzies and narrow conenagles to produce a photo-like image of what is under the surface. 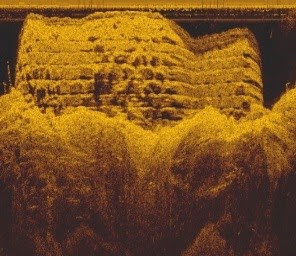 Scanning sonar for recreational fishing typically consists of sonar looking down (DownScan) and/ or sonar looking to both sides of the boat (SideScan). 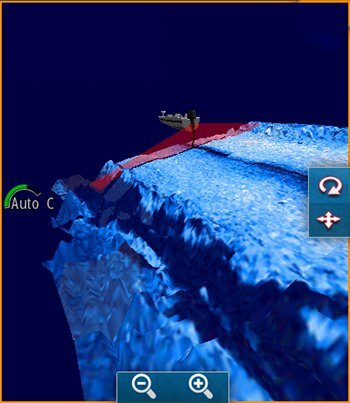 Lowrance and Simrad use the term StructureScan for both. In the image below I`m trying to show you how the difference in coneangles (and -shape) of 2D, DownScan and SideScan effects what you are looking at. The first one is the classic 2D-view. We see the fish as arches (as long as the boat is moving) and bottom-structure drawn as a line on the screen. 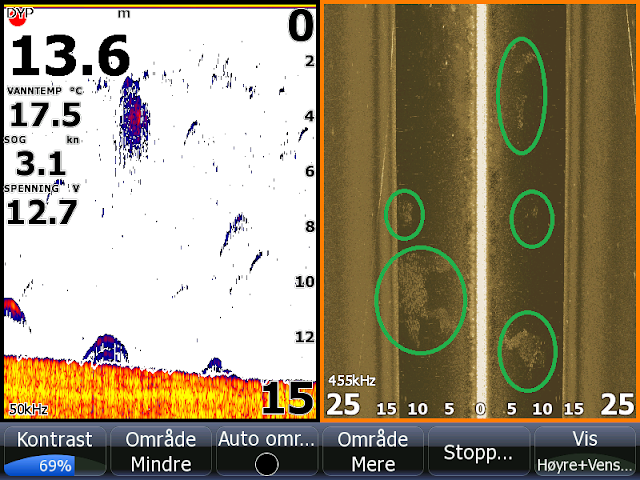 From the size, shape and colour of the arches we can guess how far from the ducer the fish are, and in som cases even what size they are. From looking at how the bottom-structure is drawn, we can guess bottom-composition (soft or hard). 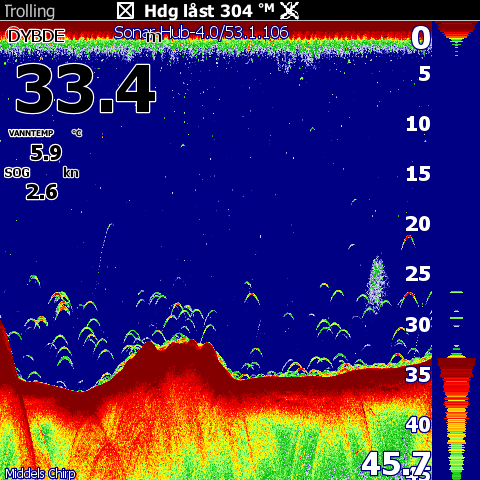 In the image above we are looking at a shoal of small baitfish. The fish are small and sit to close to eachother for the 2D to separate them and they look like what anglers referr to as a "baitball". In Downscan we see the single fish, and even a log or stick in the midle of the shoal. (black circle). And this is where DownScan really sets it self apart from 2D, details in relatively shallow water (down to 60 meters or so depending on conditions.) With DownScan you can look at a brushpile, and see if there is fish in the brushpile. The fish will not show as the classic arches, but look more like small dots. On the 2D we see some fish, buth with the wide perspective of SideScan we see a lot more. 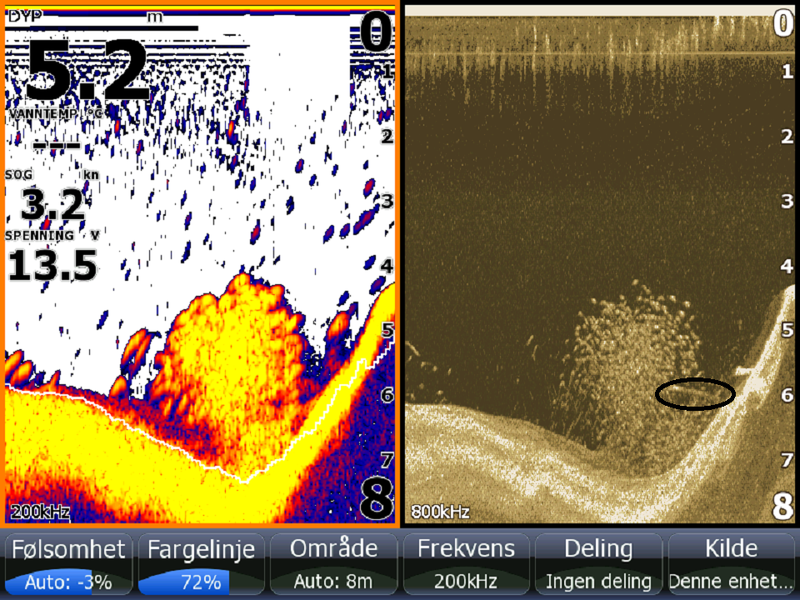 On both sides of the boat there are large shoals of baitfish (green circles) and even one larger fish. 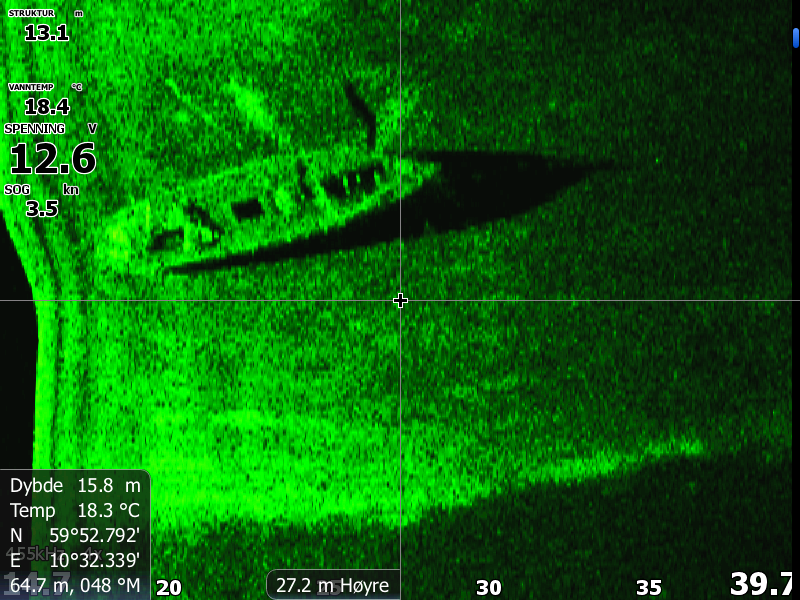 In the midle of the SideScan-image you see a white line, this is effectively the course of the boat since we are looking aproximately 89-90 degrees out to each side of the boat. You see the watercoloumn (and fish) and then the bottom (rather dull in this image). 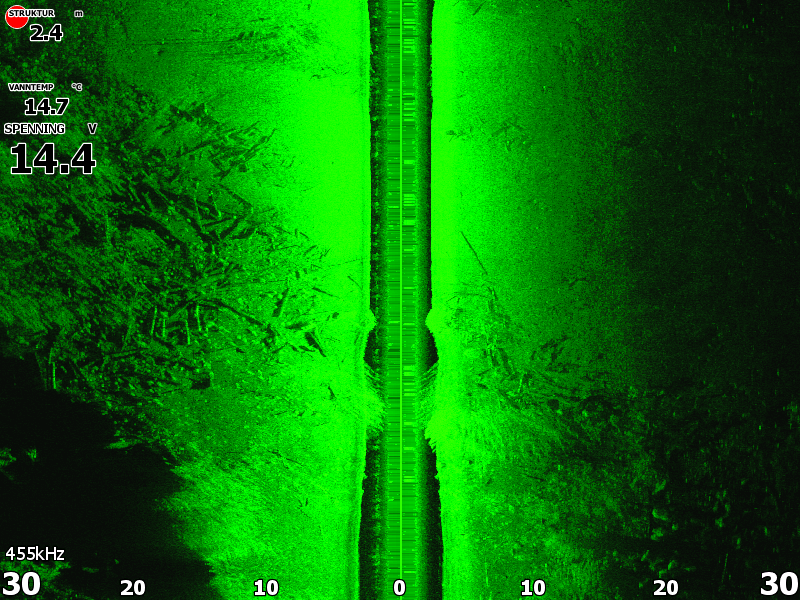 To summarize, scanning sonar is a great tool when looking for both structure and fish, and suplements our 2D-sonar well. But in order to make the most of this tech, we need to take care when setting up the ducer, and learn the basics of how it works so we can decipher the image and use the information for our needs. And with those facts fresh in our memory, it is time to look at what transducers we have to choose from and what they will do for us. HDI, or Hybrid Dual Imaging, came to light when the range of models called Elite HDI was introduced. 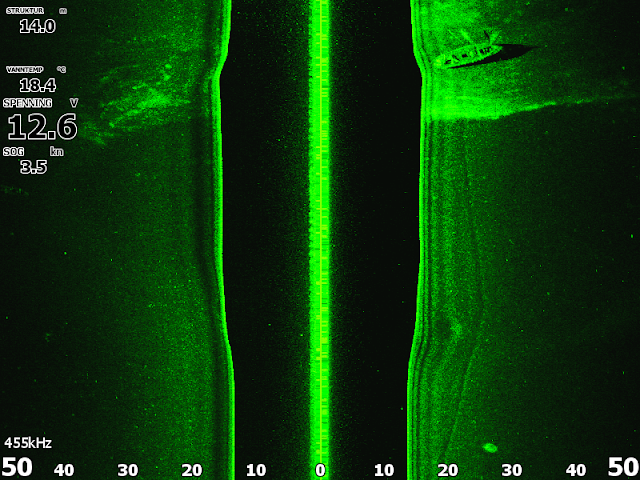 It combines one element for 2D-sonar (the "normal" sonar) and one element for DownScan. 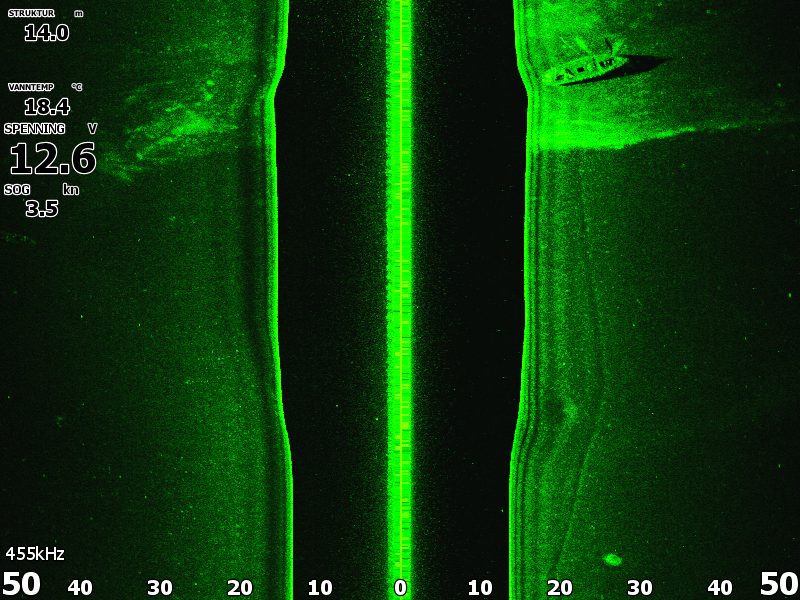 As a result, this ducer is not capable of producing SideScan, even if it is connected to a sonar-unit with such capabilities. The HDI-ducers come in four versions. Two different 2D-elements, and two different plugs/ connectors. The two connectors are the blue 7-pin (as in the pic above) and the black 9-pin, choose the connector that fits your sonarunit. (There are adapters available as well.) The name of the ducer tells you which 2D-element it has, both have the same DownScan-element. Since both 83/200/455/800-HDI and 50/200/455/800-HDI use the same DownScan-element, there is no difference in the DownScan-images produced. You have two DownScan-frequenzies to choose from, 455 and 800 kHz. 455 has a sligthly wider coneangle, and the lower frequenzy has less signalloss in deeper water. 800 has a sligthly more narrow coneangle covering a smaller area under your boat, but will normally give the sharpest images in shallow water. In this case less then 10 meters/ 30 feet - but 800 kHz is sensitive for algea and dirt in the water, so make sure to try 455 kHz as well. 83/200/455/800-HDI is the most common model, often sold in package-deals with compatible units. For 2D it is capable of 83 and 200 kHz with coneangles 52 and 22 degrees measured at -3db. It can also be used with medium chirp and high chirp for 2D on sonarmodels that are chirp-capable. 50/200/455/800-HDI is often referred to as a "saltwater model". This is due to its more narrow coneangles for 2D, a lower low-frequenzy and because the larger 2D-element (compared to 83/200) can handle more power. But there are a lot of freshwater-anglers using the 50/200/455/800-HDI with success as well. Personaly I prefer it over 83/200/455/800-HDI, because of its narrow coneangles and more sensitive 2D-element. 50 kHz has a coneangle of 29 and 200 kHz a coneangle of 12. With a chirp-capable sonarunit, the 50/200/455/800-HDI can be used in low chirp and high chirp as well. The HDI-ducers are good choices for small boats that do not have room for both a 2D-ducer and LSS-2 on the transom, and for users that does not feel the need for SideScan. It can also be mounted under a trollingmotor, using a special bracket. Before HDI Lowrance had another small (ish) ducer cabable of DownScan called DSI. DSI (DownScan Imaging) was used with early Elite models, and can only produce downscan, not 2D. 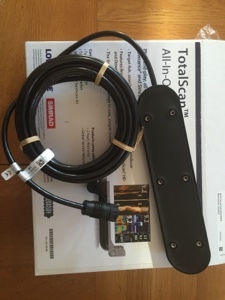 TotalScan is the "all in one"-alternative, and uses the 9-pin black connector. Like HDI it has elements for 2D and DownScan, but it also has elements for SideScan. 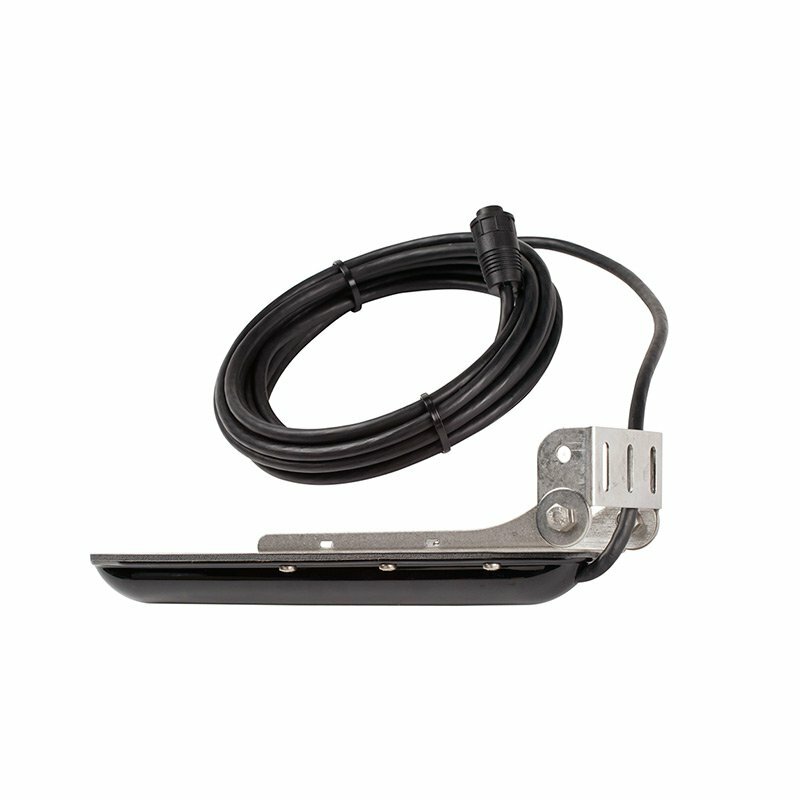 This makes for easy installation, especially on small boats with limited space at the transom for multiple transducers. But it can also be negative, in order to have 2D-readings while on plane the Totalscan has to be placed low enough, making it more exposed as well. Proper installation and exact adjustement are key factors here. The older HDS-models HDS Gen 1 and HDS Gen 2 requires the use of a module to use LSS-2. Such modules are StructureScan HD and Sonarhub. This is the most expencive alternative, both by its own account and since it requires a newer HDS-unit as well. As with LSS-2 you will need a seperate ducer for 2D. SS3D has one extra set of cheramic elements versus LSS-2. These extra elements only recive acoustic signals, they do not send like the other elements does. The point in doing this is to be able to recive the echo from another angle then what is possible with LSS-2. In doing so two things are accomplished. By calculating the difference in angle and time between the reciving elements one can render a 3D-image. By reciving the echo from another angle, echos that would otherwize not be recived are now recived and processed, giving more detail and range. SS3D reqires both the ducer and the module. The ducer connects to the module using TWO 9-pin connectors, one for the elements both sending and reciving and one for the elements that only recive. It is when the software in the module compares these two, the advantage of SS3D is made possible. SS3D is good choice for anyone depending on SideScan. The added range and detail compared to LSS-2 is noticable, and the 3D-function makes interpreting the image a lot easier. 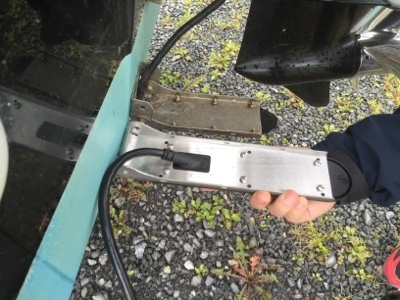 But the share size of the ducer combined with the added tech of the module, can make it a challenge to mount on smaller boats. Earlier HDS models like HDS Gen 2 and HDS Gen 2 Touch can be used with SideScan and DownScan from the StructureScan 3D module med ducer, but can not show the 3D-view. Moving on from the tech, which one should you choose and why? 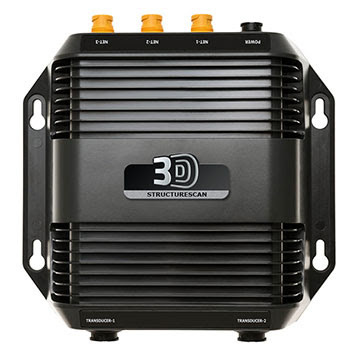 Offcourse the full package with HDS-units, a good 2D-ducer and SS 3D outshines the alternatives, but it comes with a pricetag to match the performance. At the moment I see no alternatives on the market that deliver the same quality images from SideScan at long ranges then SS 3D. (And that includes Humminbirds Mega and Lowrance Active Imaging.) The dowscan is the same as with LSS-2, but the SideScan is a big improvement. I would not call it a "game-changer" but it is definitely a big improvement. 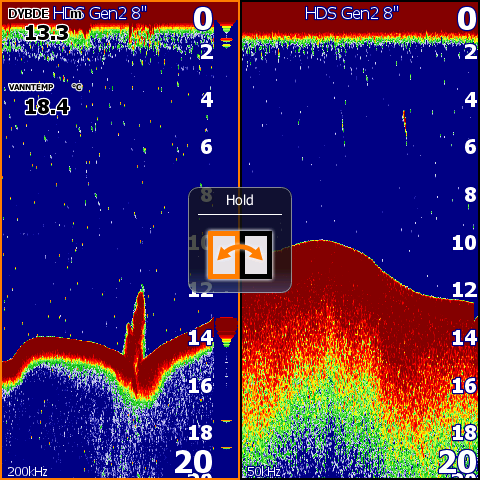 So if SideScan is important for your fishing, it is time to dig into your wallet. 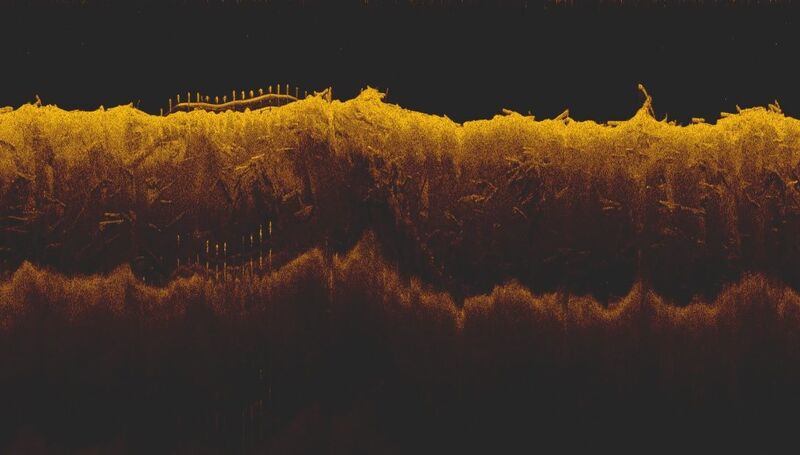 SideScan from SS 3D, logs in shallow water in a narrow river. 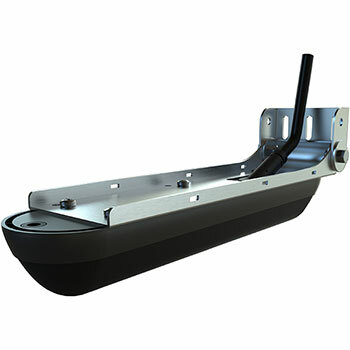 Due to its size and price, SS 3D is probably noot a good alternative on small boats or boats that see a lot of timber or rocks. If used in such areas, the ducer should at least be mounted high enough to be out of the water while on plane. That said, I see no difference between DownScan/ SideScan from LSS-2 and that from TotalScan. 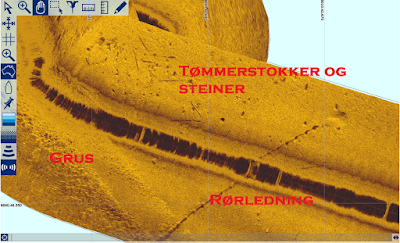 In theory the TotalScan should give slightly less sharp images, due to it having shorter cheramic elements inside, but out on the water I can not say I see any difference. 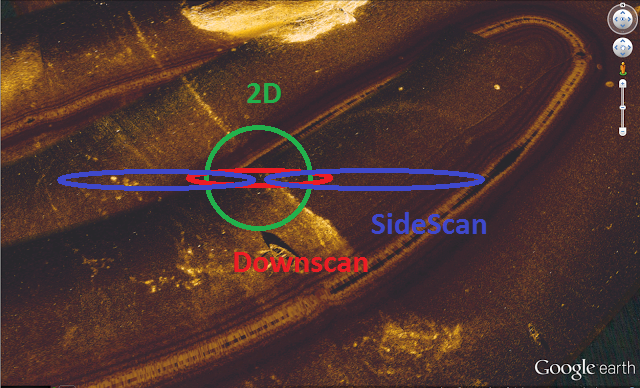 So if space (or budget) is to tight for both a 2D-ducer and LSS-2 (or SS3D) TotalScan could be a good choice. The 2D from TotalScan is the same as from 83/200/455/800-HDI or HST-WSBL. 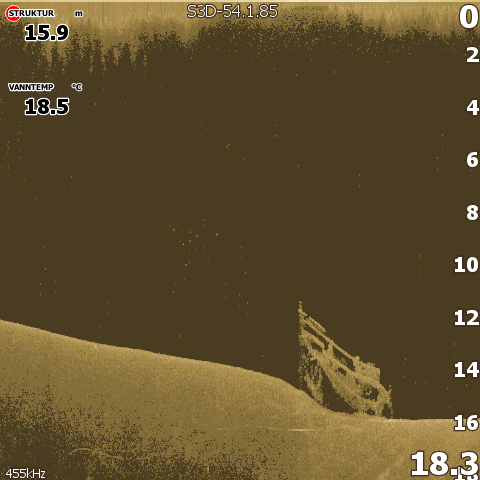 SideScan from TotalScan, logs, rocks and gravel over sand. If the budget is thight, or space for mounting the ducer is limited like under a trollingmotor, the HDI-ducer is a good alternative. It has been around for quite some time, has a reasonable price, and does what it says on the box. Personally I use HDI-ducers for my mobile-setup, used when icefishing or when renting a boat without sonar. 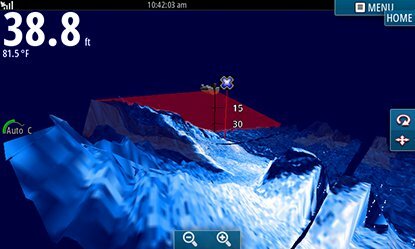 The world of sonar is an ever changing one, and since I wrote this article back in February 2017 there has been some changes. 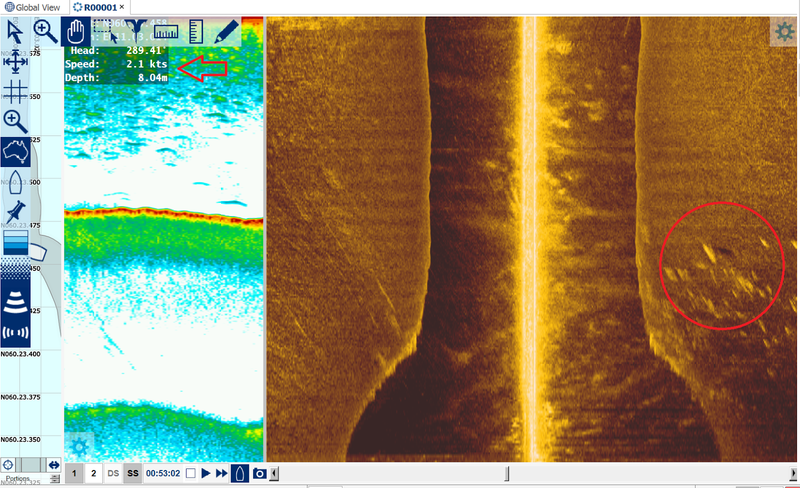 The most important one beeing that in the US, Lowrance has sold the Elite Ti models with a Y-cable enabling you to combine the Elite Ti with LSS-2 and a Lowrance 2D-ducer of choice (like HST-WSBL and so on). This option has only been available in the US, and only as bundles with unit, Y-cable and LSS-2. 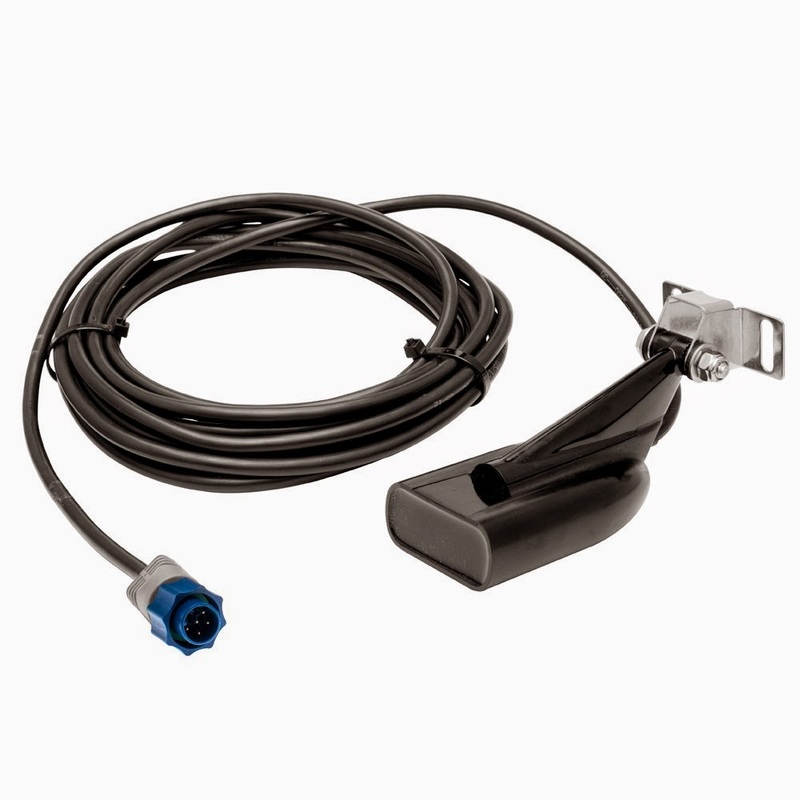 Unfortunately the Y-cable does not work with Airmars 2D-ducers, nor is it sold as a seperate item as of today. With the launch of the new units Elite Ti2 and HDS Live, we saw two new ducers as well. The "3 in 1" replaces TotalScan, and the "2 in 1" replaces LSS-2. StructureScan 3D goes on unchanged. More info on these new ducers will follow, but for now they are only compatible with Elite Ti2 and HDS Live, as well as HDS Carbon running the 18.3 (or higher) software.